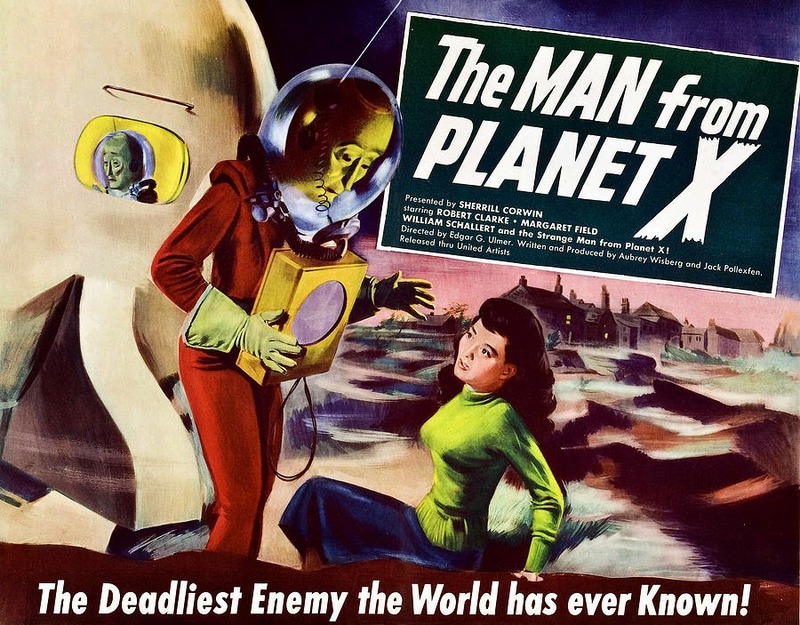 Depending upon whom you read, The Man From Planet X is one of the first, if not the first, science fiction film where aliens make contact with earth. Director Edgar G. Ulmer (The Black Cat) works with half-a-shoestring budget of $50,000 and an so-so screenplay and comes up with a film that’s better than both! The story begins when an astronomer discovers a mysterious planet he ingeniously calls “Planet X.” [I bet it took him a long time to think up that one!] Why a planet is hurling through space is anyone’s guess [It should have been a comet or asteroid] but you just have to go with it! Meanwhile a mysterious spaceship lands nearby that looks a bit like a Christmas tree ornament! It’s barely big enough to house the alien inside, but, again, you just have to go with it! When the alien is finally revealed, his large expressionless head looks like a piñata stuffed into a space helmet. Thankfully the two people who are credited as providing the special effects on this film have extremely short resumes. In spite of these drawbacks, the acting is quite good and the film is paced nicely as well. The only familiar face in the cast is character actor William Schallert [True Blood] who plays the “always-sneaking-around and is probably up to no good” Dr. Mears. The only female in the cast, Enid Elliott, played by Margaret Field, assumes the role of research assistant/perfect 1950’s housewife and does little more than talk excitedly and wait for the men to check things out! Sigh! The Man From Planet X is not a bad film. For $50,000 it’s astonishing. If the studio was only able to spend a little more on the alien and the spaceship, it could have been a very good movie. As a final note, I streamed this movie in Netflix and the print was quite dark. I’m sure there are other alternatives out there so be prepared!